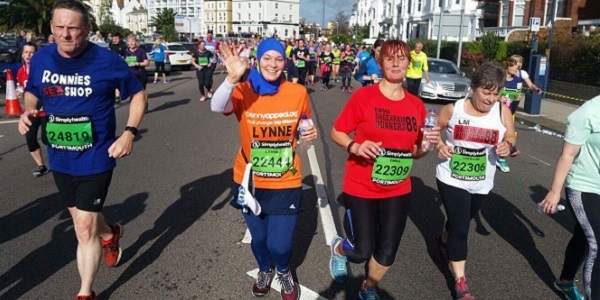 DAGENHAM 88 runner Lynne Northcott, aka Jogonhijabi, returned home to complete The Great South Run as part of her preparations for the London Marathon. Northcott is running for the Penny Appeal to raise funds for a fresh water project in The Gambia and was keen on this race because it was a return to her childhood days. In order to keep going, Northcott focussed on the important cause she is supporting. “This run was all part of my fundraising, training and my journey to the London Marathon 2018,” she said. “I am aiming to raise £5,000 to build a deep water well in the Gambia, which will supply a whole village with fresh water for drinking, livestock and vegetation. Northcott, who outran a Donald Trump cosplayer at the finish line, cited the presence of her family among a loud, cheering, 25,000-strong crowd lining the streets as vital in her completing the biggest 10 mile race in Europe. It’s great to hear about your brilliant running efforts, mashallah. Would you be interested in contributing an inspiring article to our blog, to encourage other sisters to follow in your footsteps, inshallah? We’re always looking for new writers and you’d be very welcome!